Our program conserves and protects 10 miles of sea turtle nesting beach on the Osa Peninsula—a largely untouched, and amazingly beautiful tropical rainforest located in southwestern Costa Rica. This rewarding program allows you to monitor sea turtle movements, protect hatchlings and learn about sea turtle conservation—all on some of the most incredible beaches in the world, from Matapalo to Carate. 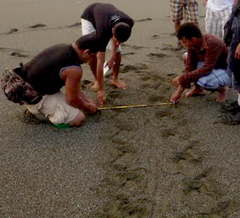 Our sea turtle program relies on volunteer support to increase our presence on these beaches and help reduce poaching pressure. Spaces are available from July through December – please visit our sea turtle volunteer page to sign up, or send this info to people you think may be interested. Volunteering is a great way to experience this unique place while giving back through valuable conservation efforts. There are four species of sea turtles that nest on the beaches of the Osa Peninsula – Leatherback (Dermochelys coriacea), Hawksbill (Eretmochelys imbricata), East Pacific Green (Chelonia mydas), and Olive Ridley (Lepidochelys olivacea). Our efforts focus largely on the latter two as they are the most common to these beaches. In the past two nesting seasons, we have ensured the successful hatching of more than 16,000 baby sea turtles! One of the most intriguing mysteries about these ancient sea turtles is how, after many years of swimming in the open ocean, they manage to find their way back to their natal beach to lay their eggs. While there are many hypotheses as to how sea turtles navigate, there is no singular explanation. Sea turtles use multiple cues in navigation. Visual cues, such as crawling towards the lower, brighter seaward horizon and away from the dark, elevated silhouettes of vegetation and dunes help orient newly hatched turtles toward the ocean. Using waves as a compass, these turtles head seaward by detecting orbital movements from underwater. It is also thought that sea turtles use the earth’s magnetic field as a compass to approximate their global position and navigate to nesting and feeding areas. Finally, there is evidence that sea turtle hatchlings imprint chemical cues unique to their natal beach and use this information as adults to return to the same beach for nesting. Female hatchlings that leave the beach each year may not return to nest for up to 20 years. When she finally makes it to her nesting beach, a female sea turtle may make multiple unsuccessful attempts to nest, and some females will return to lay more than once a season. The most abundant species on the Osa Peninsula is the Olive Ridley, which lay clutch sizes of 100 eggs and may nest as many as three times per season. The next most abundant species that we work with in our Sea Turtle Conservation Program is the East Pacific Green, which lay clutches of up to 150 eggs, and may nest up to six times per season! With such impressive fecundity, you may be wondering why these deft mariners, that have navigated the oceans for more than 100 million years, are in so much need of protection. Even before a hatchling emerges from its shell, it faces a gauntlet of hazards. While incubating in the nest cavity, eggs are sometimes predated upon by coati (Nasua narica) or dogs that are allowed to roam the beach. Many of the pressures that are leading to drastic declines of all of the world’s sea turtle species, are human-induced. Turtle eggs are still sought after, albeit illegally, for human consumption because of their purported ability to increase male virility—poachers visit nesting beaches to dig up eggs and then sell them in urban centers on the black market. For the nests that make it through the 45-70 day incubation period, the baby turtles are highly susceptible to predation by large raptors before they can make it to the ocean. Adult sea turtles in the open ocean may suffocate from ingesting plastic bags mistaken for jelly fish. If a sea turtle makes it to sexual maturity and is ready to find her way back to her nesting beach, she still must brave a wall of death off the Pacific Coast in the form of fleets of long-line fishing boats and gill nets. Because sea turtles are not able to breathe underwater, when they are accidentally ensnared in commercial fishing nets, they will most certainly drown. It sounds daunting, but there is a lot that we can do to save the sea turtles and ensure that these species continue to exist in the future. 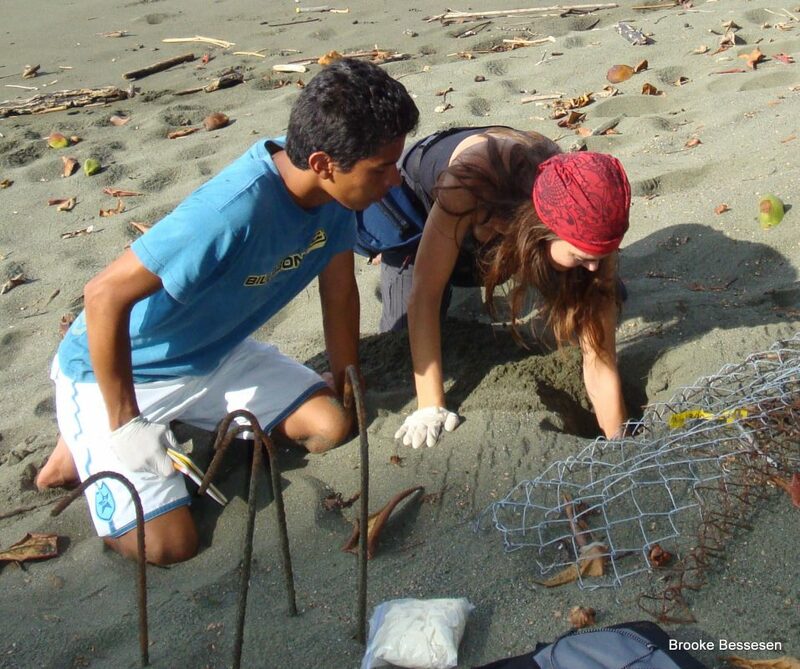 The goal of Osa Conservation’s sea turtle conservation program is to guarantee the health and ecological success of the sea turtles nesting on the Osa Peninsula, Costa Rica, by integrating conservation, research, and educational outreach. This year we are also giving weekly educational presentations to guests at lodges on the Osa Peninsula, especially those on the nesting beaches, such as Bosque del Cabo, El Remanso and Finca Exotica. This entry was posted in Sea Turtles, Volunteers and Visitors and tagged Osa Biodiversity, Osa Peninsula, sea turtle conservation, volunteer. Bookmark the permalink.